I don’t know about you, but as Harry Homeowner* I have hung – and removed – all the wallpaper I ever will. I’m over it. I don’t care if it’s “coming back” in style or not – it’s never coming back in my house. That said, there is still wallpaper in my house to be removed. But I’m not doing it. However . . . for those of you still young or poor enough, with an urge to do it yourself, it’s pretty simple. 1. Cover surrounding surfaces — floors, baseboards, countertops and any other exposed areas. 2. 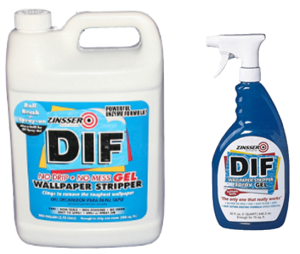 Get a wallpaper removal solution (such as Zinsser DIF gel) from your local hardware store. 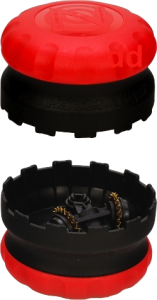 Follow the instructions on the label and mix the solution with warm water into a pump-up sprayer or bucket. 3. Apply the mixture generously with a sprayer or a sponge on the wallpaper. 4. Give the solution about five minutes to set. Then, apply a second coat. When it comes to the wallpaper being saturated, the wetter, the better! 5. Wait 25 minutes for the second coat to soak into the wallpaper. This will allow the solution-water mixture to loosen the glue holding the paper to the wall. 6. Start from the top of the wall and slowly peel off the wallpaper in a downward motion. Wallpaper comes in two layers, a decorative layer and a backing layer. Simply repeat steps 3 through 6 for the backing layer. If a layer of wallpaper does not come off, add some more water to it, wait a little while and try again. 7. Excess glue can usually be taken off with more solution-water mixture and a sponge, hand towel or stiff brush. If you find that there are sections where the wallpaper is not peeling off, use a perforator such as a Paper Tiger to aerate the section. Then, reapply a good coat of solution-water mixture, let it soak and attempt to peel it off again. If needed, use a flexible putty knife to scrape off difficult areas, but only as a last resort. *Harry Homeowner was a trademark of Hechinger Company, back in the day. Now it’s used as a term for perpetrators of really bad do-it-yourself projects.